This is a continuation of a blog I began on April 12. It is the second part of a story I wrote for City Link weekly newspaper in Fort Lauderdale, Florida, when I was the visual art critic. The print date for this story about the legendary painter Andre Pierre is December 16, 1998. I feel fortunate to have met him on several occasions at his home in Haiti, a lively compound supporting several generations. No shady studio beckons Pierre, who is always close to his muse. He paints outdoors, under a thatched roof held up by trees and branches, while sitting in a green chair with a cane seat and a pillow. Dogs, chickens and goats roam close by. But the artist isn’t distracted by these animals or children playing a few huts away. It’s clear that this simple life appeals to Pierre, as he creates paintings of mermaids like the goddess La Sirene and Baron Samedi, judge of the living and the dead. Through these spirits, Pierre believes that all things are possible. He’s living proof of that — by honoring the spirits, he has achieved success in his life, painting on commission for the ambassador of Venezuela and hosting a visit by the president of Senegal. How strange to reflect on a very different art scene in Port-au-Prince just two nights before. My friend, Haitian art dealer Dr. Carlos Jara, takes me to a public exhibit by students of the National School of the Arts. There isn’t an original, interesting work among the dozen paintings set upon on easels. There are, however, several jaw-droppingly bad works by someone named “Dufo” who turns out to be the son of the famous fantasy landscape artist Prefete Duffaut. The worst portrays a large orange crucifix offset by 50 cent piece-size holes in the canvas. Trying not to laugh, we exit quickly. “In all my years in Haiti, I haven’t seen one talent emerge from that school,” Jara says. Pierre’s story is different from these students in search of a style. He’s self-taught and spiritually inspired. On the easel before him today is a nearly completed portrait of three Vodou spirits — Erzulie Freda Dahomey, Damballah Ouedo and Ogoun Batagri. The trio are regally dressed, like the kings and queens of a teeming jungle. Nature is alive in Pierre’s paintings. Even the seas and rivers he paints have an energetic quality. What got him started as an artist 50 years ago was his belief in Vodou (voodoo), says the man who became a houngan, or Vodou priest, in the 1970s. He painted murals for the inside of a Vodou temple in Croix-des-Bouquets, a 45-minute drive from Port-au-Prince. They were noticed by an American anthropologist and author, Maya Deren, who passed on word about Pierre to De Witt Peters, another American in Haiti. Peter went to the island in 1944 as a conscientious objector to World War II. In lieu of military service, he opened Le Centre d’Art in Port-au-Prince, providing materials to artists and access to art-buying tourists. But it is Deren whom Pierre credits with launching his career. In the good old days of the 1980s and 1990s, the auction houses of Christie’s and Sotheby’s, both in New York City, would produce a full-color catalog of Latin American art up for grabs each May and November. Often, in the back of those catalogs, was a small selection of Haitian art by top-tier artists like Andre Pierre, Antoine Obin, and Hector Hyppolite, along with distinguished work by lesser-known artists. Those days are long gone. The decline began when the auction houses set a low reserve price of $1,000 for any piece of Haitian art, thus shutting out many Haitian paintings and other artworks valued at less than $1,000. Now, it’s a matter of finding auctions of Haitian art here and there. One consistent place is the Slotin Folk Art Auction, which occurs twice yearly — in spring and fall — in Buford, Georgia, outside Atlanta. While the bulk of items are by American self-taught artists, there are usually a dozen or so pieces from Haitian artists that can be yours for a proverbial song. It is definitely a buyers’ market at this time. For collectors, the Slotin auction is a gold mine. Over the years, I have gotten from Slotin auctions my first painting by fantasy landscape master Prefete Duffaut, a gorgeous painting of a waterfall in a rain forest, a saintly painting of maternal devotion by Saincilus Ismael, and a superior night scene by the oh-so-underrated Bourmond Byron. But my best buy from the Slotin auction was a signed iron cross by George Liautaud. Set on a base, the cross ends in the shape of three hearts. It is a magnificent piece. In all cases of my winning bids, I paid less than the going market prices for these artists and considered myself fortunate. Next weekend, on April 26 and 27, at the next Slotin Folk Art Auction, collectors of Haitian art can bid on “Fantasy Animals” by Fritz Dominique, “Ceremony for Agauroux L’Ephema Who Appears as a Bird” by La Fortune Felix, a Vodou flag called “Pink Mermaid” by an unknown artists, and “Voodoo Cane,” a figural walking cane attributed to (though unsigned) by Pierrot Barra, who used to hold court in the Iron Market in Port-au-Prince. There are also paintings by Gelin Buteau, one of my favorite artists. My interest was piqued by “Village Day” (1986), measuring 36 inches by 24 inches, by Adam Leontus. It portrays people working in a tree-filled area near a thatched-roof house. The provenance of the piece includes Le Musee d’Art Haitien and the collection of Georges S. Nader. The low estimate is a mere $1,000. Wilson Bigaud fanss, take note. There are two paintings in the upcoming Slotin auction up for bids. “Village Life By the River” and “Washing in Town’s River,” both undated, are substantial paintings of considerable appeal. Thematically, they are related. Perhaps, some wise collector will place the paintings side-by-side in a living room. Don’t pass up the wood sculpture “Eve with Snake and Apple” by Nacius Joseph and the odd but charming “Les Sirenes (Mermaids)” by Georges Liautaud. Since most collectors stick to paintings, you may take home one of these great sculptural pieces for less than the low estimated price. And Slotin has no reserve prices — who ever bids has a possibility to take home something, even if the bid is far below the estimated price. That’s the fun and funny thing about auctions. You may quickly be outbid by others with deeper pockets. Or you may be successful by being the only one interested in a piece. Don’t forget — you must also pay a buyer’s premium. And you have to pay for shipping, unless you attend the auction in person. For a catalog and to become a phone bidder, call 1-770-532-1115 or 1-404-403-4244. Or see the pieces online at www.slotinfolkart.com. 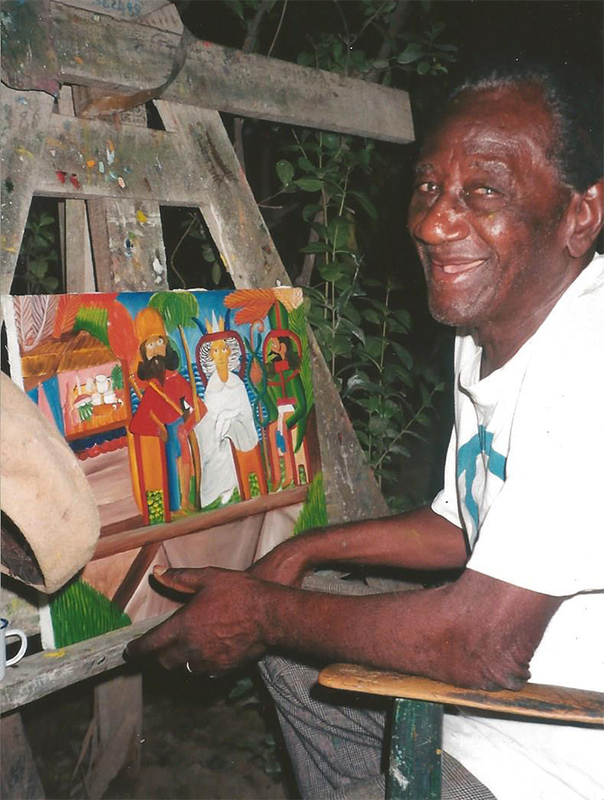 When I was the art critic for City Link weekly newspaper in Fort Lauderdale, Florida, I wrote about esteemed Haitian painter Andre Pierre, who was age 84 at the time. 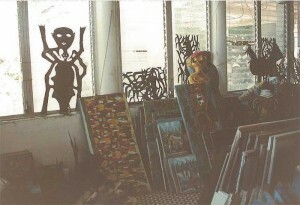 The story appeared in the December 16, 1998 edition of the publication, along with my photo of the artist sitting next to his easel with a nearly finished painting of his beloved Vodou spirits. I remember Pierre always welcoming me as a guest, no matter what he was doing or what deadline constraints he experienced when producing the next painting. In the next few weeks, this City Link story will be published on this blog in its entirety. “This is it?,” I asked my driver with dismay as he turned the car into a dirt driveway leading to the home of Haiti’s most famous living artist, Andre Pierre. Instead of the comfortable residence I expected were sparsely furnished concrete cubicles, with people cooking outside on open fire. The smell of charcoal was thick in the later afternoon air during that first meeting in 1985. I couldn’t reconcile my knowledge of Pierre, celebrated in books and museum exhibits from the U.S. to Europe, with the humble reality of his circumstances. There was no visible evidence of his fame or wealth. Yet auction houses in New York were selling his works to eager collectors, and galleries in Port-au-Prince priced his mystical canvases in the thousands of dollars. Was the artist being gypped by gallery owners? Were relatives ripping him off? Or was he a too-frequent gambler at the lottery shacks that line the main town road? Answers were provided in subsequent visits over the years. Pierre, whose work is currently on display at Fort Lauderdale’s Needlepoint Originals/Paradise Gallery, supports a large extended family, including 18 children (some gown and living in the U.S. and Canada) by six different women (12 other children have died). Some of his money goes to farming his own land. The fact is, this isn’t a man whose ego depends on material proof that he has more than most others in Haiti. His contentment comes from contact with a world that the faithless don’t see. That he is beloved by those close to him becomes obvious in another meeting with Pierre just last month, on the weekend honoring the Guede spirits governing the dead. While this 84-year-old tells jokes about his jet-black, obviously dyed hair, his middle-aged son-in-law in a Tommy Hilfiger t-shirt fields a call for him on a telephone with five lines. In saying goodbye to Pierre a few minutes later, the son-in-law affectionately rubs and cradles the old man’s head. People might not believe it if you say that Haiti, the economically poorest country in the Western hemisphere, is the richest in visual expression. But it’s not hyperbole. This true statement is justified by sound reasoning, since some Haitians who become artists are able to lift themselves and their families out of poverty and into a status of middle class or even wealth. The most successful ones have travelled to other countries as honored guests, as their artwork made its way onto the walls of museums in Europe, Canada, and the United States. 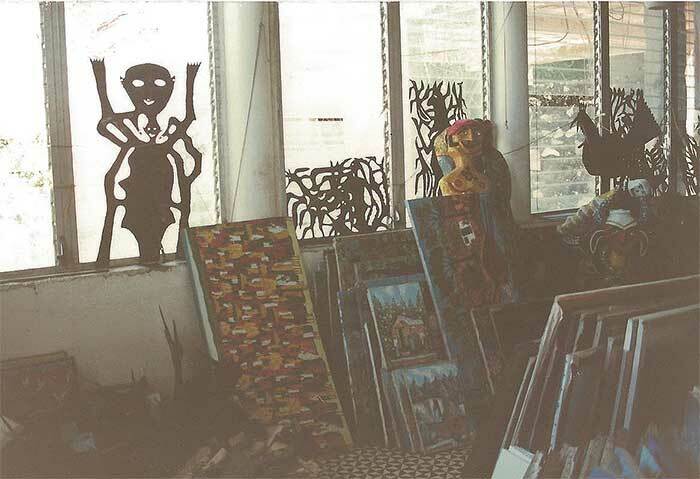 As scholars like Selden Rodman and authors like Andre Breton brought attention to the wonders of Haitian art, collectors caught Haitian art fever and made pilgrimages to the country in search of greatness. They didn’t have to look far. But navigating the gallery scene in the period from the mid-1980s to the early 2000s required a force of will and determination that put one’s patience to the test. After a day of pawing through hundreds of dusty canvases in un-air-conditioned galleries, always in search of the next most wonderful thing, I would be completely spent by around 4 p.m. and almost unable to move out of my hotel bed for dinner in the restaurant downstairs. I was also visually over-stimulated by a surfeit of beauty. My dreams followed suit with a cacophony of competing images. I was always thrilled with my purchases, no matter where I found them. Atypical of the galleries I most enjoyed visiting with their vast variety and low prices were those owned by the Nader family, including the large one owned by Georges Nader in downtown Port-au-Prince, the gallery of his son, Georges Nader Jr., in Petionville, and the son’s cousin, Habib Jiha with his own space a few blocks away. These were spotless places, easy to navigate, and well-illuminated. But the sticker shock on the beautifully framed paintings often sent me away without anything. To their owners’ credit, these comfortable, pristine spaces could easily have been transported to Paris, Quebec, or New York. The real treat in gallery hopping for me was in places like the gallery of Issa el-Saieh, up the steep road from the Hotel Oloffson in Port-au-Prince. In a country where paintings literally hang from trees, Issa adhered to a standard of excess in his gallery that I found overwhelming at first. There seemed to be absolutely no sense of order. Metal sculptures were leaning against closed jalousie windows. Figurative papier-mache sculptures of prodigious size, much bigger than the average suitcase, were moved so far out onto the tile floor that pathways between the artworks were challenging to navigate. Prices weren’t on stickers on the backs of artworks — you had to ask what they were. Visiting Issa’s jam-packed space proved to be a treat over the years. I always looked forward to exploring there, because he always had new things and it was impossible to see everything on one visit — no matter how enthusiastic I was. That changed one year when I stayed with my California friend Angela Winquist at Issa’s home, adjacent to the gallery. I remember it being filled, naturally, with exceptional art, including a large, unexpected painting by Jacques Richard Chery in his living room. This day-in, day-out access to the gallery allowed me the luxury of going through all three rooms, with stacks upon stacks, and things going sideways. Issa always knew where to find things. If, for example, you found a painting of ducks by Antoinette “Josie” Valmidor, the “cook woman” in Issa’s kitchen, and wanted to see more of her work, Issa knew just where to find it. This led one to believe that the appearance of randomness and disorganization was only in the eyes of visitors, and not in the mind of the owner of the place. It was at Issa’s that I found works by Antoinette “Josie” Valmidor’s brother Jacques in bright primary colors — a wedding scene, a family at a picnic, a fantasy landscape with a castle, and chickens as glorious stars of their own canvases. While you could find the expensive artists, too, it was the discoveries of artists that no other gallery had that helped make visiting this gallery so special. I loved sitting with Issa near the shutters in the main gallery, drinking sweet cups of expresso on hot mornings, talking about various things. He was a true character. During one visit, he tried to talk me out of a painting I had found in his gallery. What kind of gallery owner does this? But Issa was insistent. “Selden Rodman saw it and didn’t buy it,” he warned me of the 24-inch by 24-inch painting in black-and-white by Saint Soleil master Levoy Exil. This wasn’t enough to dissuade me. I bought the painting, kept it, and still get great pleasure not only from the work, but the story that accompanies it.